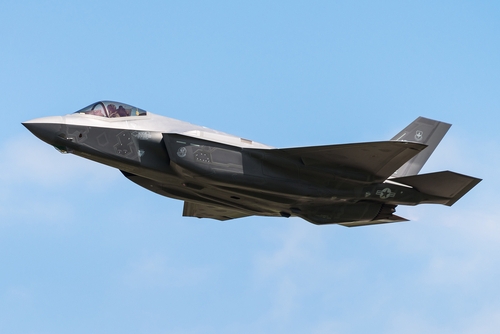 Lockheed Martin Corporation (NYSE: LMT) is in the final stages of negotiating a deal worth more than $37 billion to sell a record 440 F-35 fighter jets to a group of 11 nations including the United States, two people familiar with the talks said according to a report by Reuters. The pricing of the jets was not final according to the sources, but the average price of the 440 jets expected to be $85 million. Executive Jeff Babione said on Monday at the Paris Air Show, "This more than doubles the total amount of airplanes under contract, and that we'll be building." A report by CNN points out the progress and the technological innovations of the jet fighter plane. Testing is 90% complete, and the full production rate of the aircraft is scheduled for April 2019. The production process could cost the U.S. Department of Defense about a billion dollars more than what the entail budget for the jet was 2011 when the program was restructured. The F-35 is the nation's most technologically innovative and sophisticated fighter jet, built in with stealth technology and a cockpit helmet display that allows pilots to virtually see through the airplane at targets on the ground below. The deal promises big economic benefits according to Babione. The deal will secure and possibly create more jobs at Lockheed and international partner factories in Texas, Italy and Japan, where more than 140 jets are currently in production. The deal would support about 150,000 jobs worldwide connected to the program and a projected 200,000 jobs that eventually would be added, CNN reported.